WILMINGTON, N.C. – Cape Fear Museum has been awarded a $9,740 grant from Duke Energy. Funds will be used to fund Electricity and Magnetism field trips for fourth graders in New Hanover County and Pender County schools. In the 90-minute field trip, students conduct experiments and work in groups to explore the science of electricity and magnetism. Hands-on activities include discovering what is magnetic and non-magnetic, finding out how different materials respond to static electrical charges and creating a circuit to power a light bulb. “We are grateful for Duke Energy’s generous investment as well as their support of STEM (science, technology, engineering and math) programming for students. 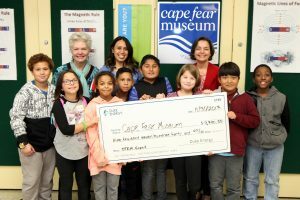 Electricity and Magnetism is a great way to reinforce what students learn in the classroom,” says Sheryl Kingery Mays, Cape Fear Museum’s director. Duke Energy employees and retirees actively contribute to their communities as volunteers and leaders at a wide variety of nonprofit organizations. Duke Energy is committed to building on its legacy of community service. For more information, visit www.duke-energy.com/foundation.